Marketing Information: It’s easier than ever for small business owners to monitor their premises round the clock against the risk of intrusion and disturbances. The SNC-CX600W is a compact, affordable wireless security camera that’s ideal for safeguarding offices, restaurants, hotels and other small business premises. 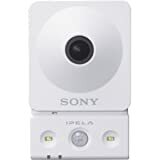 Offering crisp, clear HD 720p picture quality, the SNC-CX600W includes many of the core imaging technologies featured in Sony’s acclaimed sixth generation (G6) video security camera range. Powered by the acclaimed IPELA ENGINE EX signal processing platform, you’ll enjoy excellent imaging quality plus intelligent analytics.